Here from 1971 we have a Jacobacci Studio II in a walnut finish and outfitted with a pair of high impedance Benedetti pickups. It is, I believe, a hollowbody guitar, although it sports no soundholes. Although the guitar has been refretted and has replacement Kluson tuners it is still a very desirable piece from this French luthier (we previously looked at a Jacobacci tenor guitar here on Guitarz). 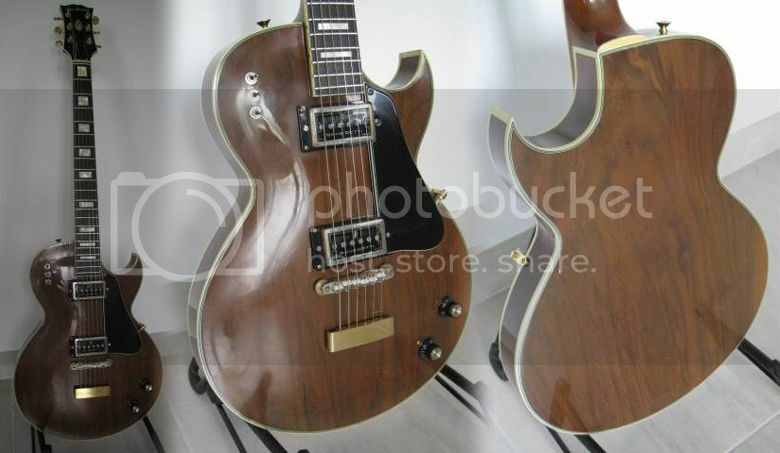 This guitar is currently being advertised for sale, and the seller is asking €2300 for it. Thanks to Dirk for bringing this fine guitar to our attention. © 2012, Guitarz - The Original Guitar Blog - now in its 10th year! Can anyone identify this Hondo "Gumby" guitar? Presented by Luggage, Nashville Hotels, SharePoint, Designed by Dedicated Hosting.